Sales adviser was very helpful and informative. As for the management/finance office, very efficient and diligent and in a timely manner. Job well done. I have purchased four used auto’s from Anderson Auto Group in recent years. Have always received great service. Would definitely recommend this dealer for a great price on some A+ certified Used Autos/Trucks. Recent Arrival! As-is, Locally owned, Low miles.19/27 City/Highway MPGBecause People Matter... we will serve your needs by always doing what is right. Recent Arrival! Black 2008 Kia Optima LX 4D Sedan 5-Speed Automatic 2.7L V6 DOHC 24V FWD2.7L V6 DOHC 24V, Gray Cloth.Established in 1986 and employing nearly 450 people in Nebraska and Missouri, The Anderson Auto Group family of dealerships is designed to be Fast, Fair, Simple, & Stress-Free. Anderson Auto Group offers new & quality pre-owned vehicles with Competitive Market Pricing and a Non-Commissioned sales staff. Complimentary Benefits - see store for details Vehicle History Report on all Pre-Owned Collision Deductible Reimbursement 48-hour Return or Exchange 12 month/12,000 mile Limited Powertrain Warranty on Qualified Pre-Owned Lifetime Powertrain Warranty on Qualified New Vehicles Helping Others - A portion of all sales at Anderson Auto Group go to our 501c3 non-profit organization, Because People Matter. BPM partners with local nonprofits to provide vehicles and repair to those in need. Mike Anderson was one of 51 dealers nationwide to be nominated for the 2019 Time Dealer of the Year Award because of his support to our communities. Interested in donating your vehicle (it can be in any condition) to help support your community? Ask a salesperson today! 20/28 City/Highway MPGBecause People Matter... we will serve your needs by always doing what is right. Recent Arrival! Locally owned, Low miles, 2 years of complimentary car washes ! !, Heated door mirrors, Illuminated entry, Keyless Remote Entry w/Alarm, Remote keyless entry.Because People Matter... we will serve your needs by always doing what is right. Recent Arrival! Ivory White 2008 Pontiac Grand Prix Base 4D Sedan 4-Speed Automatic with Overdrive 3.8L V6 SFI Series III FWDOdometer is 3415 miles below market average!Established in 1986 and employing nearly 450 people in Nebraska and Missouri, The Anderson Auto Group family of dealerships is designed to be Fast, Fair, Simple, & Stress-Free. Anderson Auto Group offers new & quality pre-owned vehicles with Competitive Market Pricing and a Non-Commissioned sales staff. Complimentary Benefits - see store for details Vehicle History Report on all Pre-Owned Collision Deductible Reimbursement 48-hour Return or Exchange 12 month/12,000 mile Limited Powertrain Warranty on Qualified Pre-Owned Lifetime Powertrain Warranty on Qualified New Vehicles Helping Others - A portion of all sales at Anderson Auto Group go to our 501c3 non-profit organization, Because People Matter. BPM partners with local nonprofits to provide vehicles and repair to those in need. Mike Anderson was one of 51 dealers nationwide to be nominated for the 2019 Time Dealer of the Year Award because of his support to our communities. Interested in donating your vehicle (it can be in any condition) to help support your community? Ask a salesperson today! 18/28 City/Highway MPGBecause People Matter... we will serve your needs by always doing what is right. Recent Arrival! Gray 2007 Ford Focus SE 4D Sedan 4-Speed Automatic Duratec 2.0L I4 DOHC FWDIlluminated entry, Remote keyless entry. Odometer is 56119 miles below market average!Established in 1986 and employing nearly 450 people in Nebraska and Missouri, The Anderson Auto Group family of dealerships is designed to be Fast, Fair, Simple, & Stress-Free. Anderson Auto Group offers new & quality pre-owned vehicles with Competitive Market Pricing and a Non-Commissioned sales staff. Complimentary Benefits - see store for details Vehicle History Report on all Pre-Owned Collision Deductible Reimbursement 48-hour Return or Exchange 12 month/12,000 mile Limited Powertrain Warranty on Qualified Pre-Owned Lifetime Powertrain Warranty on Qualified New Vehicles Helping Others - A portion of all sales at Anderson Auto Group go to our 501c3 non-profit organization, Because People Matter. BPM partners with local nonprofits to provide vehicles and repair to those in need. Mike Anderson was one of 51 dealers nationwide to be nominated for the 2019 Time Dealer of the Year Award because of his support to our communities. Interested in donating your vehicle (it can be in any condition) to help support your community? Ask a salesperson today! 27/37 City/Highway MPGBecause People Matter... we will serve your needs by always doing what is right. Recent Arrival! Red 2010 Ford Focus SE 4D Sedan 4-Speed Automatic Duratec 2.0L I4 DOHC FWD12,000 MILE/12 MONTH POWERTRAIN, Rapid Spec 200A, 4 Speakers, ABS brakes, Air Conditioning, Alloy wheels, AM/FM radio: SIRIUS, Bumpers: body-color, CD player, Cloth Sport Bucket Seats, Driver door bin, Driver vanity mirror, Dual front impact airbags, Dual front side impact airbags, Electronic Stability Control, Four wheel independent suspension, Front anti-roll bar, Front Bucket Seats, Front Center Armrest w/Storage, Front reading lights, Illuminated entry, Low tire pressure warning, Occupant sensing airbag, Outside temperature display, Overhead airbag, Panic alarm, Passenger door bin, Passenger vanity mirror, Power door mirrors, Power steering, Power windows, Radio data system, Rear window defroster, Remote keyless entry, Security system, SIRIUS Satellite Radio, Split folding rear seat, Tachometer, Tilt steering wheel, Traction control, Trip computer, Variably intermittent wipers, Rapid Spec 200A. Odometer is 1832 miles below market average!Established in 1986 and employing nearly 450 people in Nebraska and Missouri, The Anderson Auto Group family of dealerships is designed to be Fast, Fair, Simple, & Stress-Free. Anderson Auto Group offers new & quality pre-owned vehicles with Competitive Market Pricing and a Non-Commissioned sales staff. Complimentary Benefits - see store for details Vehicle History Report on all Pre-Owned Collision Deductible Reimbursement 48-hour Return or Exchange 12 month/12,000 mile Limited Powertrain Warranty on Qualified Pre-Owned Lifetime Powertrain Warranty on Qualified New Vehicles Helping Others - A portion of all sales at Anderson Auto Group go to our 501c3 non-profit organization, Because People Matter. BPM partners with local nonprofits to provide vehicles and repair to those in need. Mike Anderson was one of 51 dealers nationwide to be nominated for the 2019 Time Dealer of the Year Award because of his support to our communities. Interested in donating your vehicle (it can be in any condition) to help support your community? Ask a salesperson today! 24/35 City/Highway MPGAwards:* 2010 KBB.com Brand Image AwardsBecause People Matter... we will serve your needs by always doing what is right. Recent Arrival! Black 2007 Ford Edge SE 4D Sport Utility 6-Speed Automatic Duratec 3.5L V6 FWDEstablished in 1986 and employing nearly 450 people in Nebraska and Missouri, The Anderson Auto Group family of dealerships is designed to be Fast, Fair, Simple, & Stress-Free. Anderson Auto Group offers new & quality pre-owned vehicles with Competitive Market Pricing and a Non-Commissioned sales staff. Complimentary Benefits - see store for details Vehicle History Report on all Pre-Owned Collision Deductible Reimbursement 48-hour Return or Exchange 12 month/12,000 mile Limited Powertrain Warranty on Qualified Pre-Owned Lifetime Powertrain Warranty on Qualified New Vehicles Helping Others - A portion of all sales at Anderson Auto Group go to our 501c3 non-profit organization, Because People Matter. BPM partners with local nonprofits to provide vehicles and repair to those in need. Mike Anderson was one of 51 dealers nationwide to be nominated for the 2019 Time Dealer of the Year Award because of his support to our communities. Interested in donating your vehicle (it can be in any condition) to help support your community? Ask a salesperson today!Awards:* 2007 KBB.com 10 Best New Road Trip VehiclesBecause People Matter... we will serve your needs by always doing what is right. Recent Arrival! Charcoal 2013 Ford Fiesta S 4D Sedan 6-Speed Automatic with Powershift 1.6L I4 Ti-VCT FWD12,000 MILE/12 MONTH POWERTRAIN, 15 Steel Wheels w/Covers, 4 Speakers, ABS brakes, Air Conditioning, AM/FM radio, AM/FM Stereo, Bumpers: body-color, Cloth Front Bucket Seats, Driver door bin, Dual front impact airbags, Dual front side impact airbags, Electronic Stability Control, Front anti-roll bar, Front Bucket Seats, Front reading lights, Front wheel independent suspension, Knee airbag, Low tire pressure warning, Occupant sensing airbag, Overhead airbag, Passenger door bin, Power door mirrors, Power steering, Radio data system, Rear window defroster, Speed-sensing steering, Split folding rear seat, Tachometer, Telescoping steering wheel, Tilt steering wheel, Traction control, Variably intermittent wipers.Established in 1986 and employing nearly 450 people in Nebraska and Missouri, The Anderson Auto Group family of dealerships is designed to be Fast, Fair, Simple, & Stress-Free. Anderson Auto Group offers new & quality pre-owned vehicles with Competitive Market Pricing and a Non-Commissioned sales staff. Complimentary Benefits - see store for details Vehicle History Report on all Pre-Owned Collision Deductible Reimbursement 48-hour Return or Exchange 12 month/12,000 mile Limited Powertrain Warranty on Qualified Pre-Owned Lifetime Powertrain Warranty on Qualified New Vehicles Helping Others - A portion of all sales at Anderson Auto Group go to our 501c3 non-profit organization, Because People Matter. BPM partners with local nonprofits to provide vehicles and repair to those in need. Mike Anderson was one of 51 dealers nationwide to be nominated for the 2019 Time Dealer of the Year Award because of his support to our communities. Interested in donating your vehicle (it can be in any condition) to help support your community? Ask a salesperson today! 29/39 City/Highway MPGAwards:* 2013 IIHS Top Safety Pick * 2013 KBB.com Brand Image AwardsBecause People Matter... we will serve your needs by always doing what is right. Recent Arrival! Odometer is 12535 miles below market average!28/38 City/Highway MPGAwards:* Car and Driver 10 Best Cars * 2012 IIHS Top Safety Pick * 2012 KBB.com Top 10 Road Trip Cars * 2012 KBB.com Top 10 Coolest New Cars Under $18,000 * 2012 KBB.com Brand Image AwardsCar and Driver, January 2017.Established in 1986 and employing nearly 450 people in Nebraska and Missouri, The Anderson Auto Group family of dealerships is designed to be Fast, Fair, Simple, & Stress-Free. Anderson Auto Group offers new & quality pre-owned vehicles with Competitive Market Pricing and a Non-Commissioned sales staff. Complimentary Benefits - see store for details Vehicle History Report on all Pre-Owned Collision Deductible Reimbursement 48-hour Return or Exchange 12 month/12,000 mile Limited Powertrain Warranty on Qualified Pre-Owned Lifetime Powertrain Warranty on Qualified New Vehicles Helping Others - A portion of all sales at Anderson Auto Group go to our 501c3 non-profit organization, Because People Matter. BPM partners with local nonprofits to provide vehicles and repair to those in need. Mike Anderson was one of 51 dealers nationwide to be nominated for the 2019 Time Dealer of the Year Award because of his support to our communities. Interested in donating your vehicle (it can be in any condition) to help support your community? Ask a salesperson today! Red Metallic 2013 Kia Optima LX 4D Sedan 6-Speed Automatic with Sportmatic 2.4L I4 DGI DOHC FWDbeige Cloth.Established in 1986 and employing nearly 450 people in Nebraska and Missouri, The Anderson Auto Group family of dealerships is designed to be Fast, Fair, Simple, & Stress-Free. Anderson Auto Group offers new & quality pre-owned vehicles with Competitive Market Pricing and a Non-Commissioned sales staff. Complimentary Benefits - see store for details Vehicle History Report on all Pre-Owned Collision Deductible Reimbursement 48-hour Return or Exchange 12 month/12,000 mile Limited Powertrain Warranty on Qualified Pre-Owned Lifetime Powertrain Warranty on Qualified New Vehicles Helping Others - A portion of all sales at Anderson Auto Group go to our 501c3 non-profit organization, Because People Matter. BPM partners with local nonprofits to provide vehicles and repair to those in need. Mike Anderson was one of 51 dealers nationwide to be nominated for the 2019 Time Dealer of the Year Award because of his support to our communities. Interested in donating your vehicle (it can be in any condition) to help support your community? Ask a salesperson today! 24/35 City/Highway MPGAwards:* 2013 IIHS Top Safety Pick * 2013 KBB.com 10 Best New Sedans Under $25,000 * 2013 KBB.com 10 Best Late-Model Used Cars Under $15,000Because People Matter... we will serve your needs by always doing what is right. Recent Arrival! Locally owned, Low miles, Autocheck accident free.22/33 City/Highway MPGAwards:* 2010 KBB.com 10 Most Comfortable Cars Under $30,000 * 2010 KBB.com Brand Image AwardsBecause People Matter... we will serve your needs by always doing what is right. Popular Vehicle Alert! This 2011 Kia Forte Koupvehicle has been viewed by 103 shoppers per week. Bright Silver Metallic 2011 Kia Forte Koup SX 2D Coupe 6-Speed Automatic with Overdrive 2.4L I4 DOHC CVVT FWD4-Wheel Disc Brakes, 6 Speakers, ABS brakes, Air Conditioning, Alloy wheels, AM/FM radio: SIRIUS, Anti-whiplash front head restraints, Brake assist, Bumpers: body-color, CD player, Driver door bin, Driver vanity mirror, Dual front impact airbags, Dual front side impact airbags, Electronic Stability Control, Front anti-roll bar, Front Bucket Seats, Front Center Armrest w/Storage, Front fog lights, Front reading lights, Front wheel independent suspension, Fully automatic headlights, Heated door mirrors, Illuminated entry, Leather Shift Knob, Low tire pressure warning, MP3 decoder, Occupant sensing airbag, Outside temperature display, Overhead airbag, Overhead console, Panic alarm, Passenger door bin, Passenger vanity mirror, Power door mirrors, Power steering, Power Sunroof w/Tilt, Power windows, Radio: AM/FM/CD/MP3/Satellite Audio System, Rear window defroster, Remote keyless entry, Remote Start, Speed control, Speed-sensing steering, Split folding rear seat, Sport Cloth Seat Trim, Steering wheel mounted audio controls, Tachometer, Telescoping steering wheel, Tilt steering wheel, Traction control, Trip computer, Turn signal indicator mirrors, Variably intermittent wipers. Priced below KBB Fair Purchase Price!Established in 1986 and employing nearly 450 people in Nebraska and Missouri, The Anderson Auto Group family of dealerships is designed to be Fast, Fair, Simple, & Stress-Free. Anderson Auto Group offers new & quality pre-owned vehicles with Competitive Market Pricing and a Non-Commissioned sales staff. Complimentary Benefits - see store for details Vehicle History Report on all Pre-Owned Collision Deductible Reimbursement 48-hour Return or Exchange 12 month/12,000 mile Limited Powertrain Warranty on Qualified Pre-Owned Lifetime Powertrain Warranty on Qualified New Vehicles Helping Others - A portion of all sales at Anderson Auto Group go to our 501c3 non-profit organization, Because People Matter. BPM partners with local nonprofits to provide vehicles and repair to those in need. Mike Anderson was one of 51 dealers nationwide to be nominated for the 2019 Time Dealer of the Year Award because of his support to our communities. Interested in donating your vehicle (it can be in any condition) to help support your community? Ask a salesperson today! 23/31 City/Highway MPGBecause People Matter... we will serve your needs by always doing what is right. Popular Vehicle Alert! This 2014 Ford Focusvehicle has been viewed by 116 shoppers in last 32 days. Recent Arrival! 3.0L V6 Flex Fuel, 6-Speed Automatic. Odometer is 19537 miles below market average!19/27 City/Highway MPGAwards:* 2010 KBB.com Brand Image AwardsEstablished in 1986 and employing nearly 450 people in Nebraska and Missouri, The Anderson Auto Group family of dealerships is designed to be Fast, Fair, Simple, & Stress-Free. 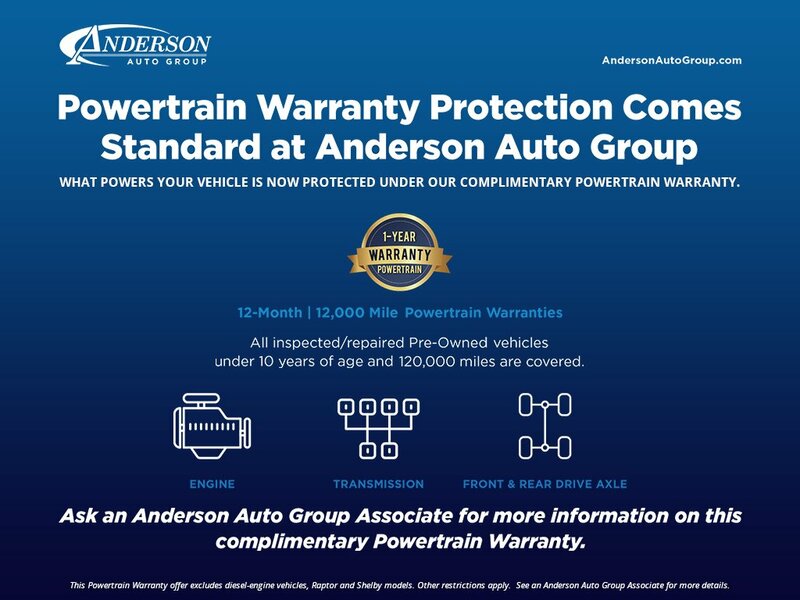 Anderson Auto Group offers new & quality pre-owned vehicles with Competitive Market Pricing and a Non-Commissioned sales staff. Complimentary Benefits - see store for details Vehicle History Report on all Pre-Owned Collision Deductible Reimbursement 48-hour Return or Exchange 12 month/12,000 mile Limited Powertrain Warranty on Qualified Pre-Owned Lifetime Powertrain Warranty on Qualified New Vehicles Helping Others - A portion of all sales at Anderson Auto Group go to our 501c3 non-profit organization, Because People Matter. BPM partners with local nonprofits to provide vehicles and repair to those in need. Mike Anderson was one of 51 dealers nationwide to be nominated for the 2019 Time Dealer of the Year Award because of his support to our communities. Interested in donating your vehicle (it can be in any condition) to help support your community? Ask a salesperson today! 6-Speed Automatic. Odometer is 8955 miles below market average!Awards:* 2012 IIHS Top Safety Pick * 2012 KBB.com 10 Best Used Family Cars Under $15,000 * 2012 KBB.com Brand Image AwardsEstablished in 1986 and employing nearly 450 people in Nebraska and Missouri, The Anderson Auto Group family of dealerships is designed to be Fast, Fair, Simple, & Stress-Free. Anderson Auto Group offers new & quality pre-owned vehicles with Competitive Market Pricing and a Non-Commissioned sales staff. Complimentary Benefits - see store for details Vehicle History Report on all Pre-Owned Collision Deductible Reimbursement 48-hour Return or Exchange 12 month/12,000 mile Limited Powertrain Warranty on Qualified Pre-Owned Lifetime Powertrain Warranty on Qualified New Vehicles Helping Others - A portion of all sales at Anderson Auto Group go to our 501c3 non-profit organization, Because People Matter. BPM partners with local nonprofits to provide vehicles and repair to those in need. Mike Anderson was one of 51 dealers nationwide to be nominated for the 2019 Time Dealer of the Year Award because of his support to our communities. Interested in donating your vehicle (it can be in any condition) to help support your community? Ask a salesperson today! Popular Vehicle Alert! This 2013 Chevrolet Cruzevehicle has been viewed by 130 shoppers in last 34 days. Odometer is 35612 miles below market average!26/38 City/Highway MPGAwards:* 2013 IIHS Top Safety PickEstablished in 1986 and employing nearly 450 people in Nebraska and Missouri, The Anderson Auto Group family of dealerships is designed to be Fast, Fair, Simple, & Stress-Free. Anderson Auto Group offers new & quality pre-owned vehicles with Competitive Market Pricing and a Non-Commissioned sales staff. Complimentary Benefits - see store for details Vehicle History Report on all Pre-Owned Collision Deductible Reimbursement 48-hour Return or Exchange 12 month/12,000 mile Limited Powertrain Warranty on Qualified Pre-Owned Lifetime Powertrain Warranty on Qualified New Vehicles Helping Others - A portion of all sales at Anderson Auto Group go to our 501c3 non-profit organization, Because People Matter. BPM partners with local nonprofits to provide vehicles and repair to those in need. Mike Anderson was one of 51 dealers nationwide to be nominated for the 2019 Time Dealer of the Year Award because of his support to our communities. Interested in donating your vehicle (it can be in any condition) to help support your community? Ask a salesperson today!